Increasing interest in nutrition, fitness and beauty consciousness has enhanced concerns over a healthy diet. Fruits and vegetables are capable of providing additional health benefits, like prevention or delaying onset of chronic diseases, as well as meeting basic nutritional requirements. Appropriate intake of a variety of fruits and vegetables ensures sufficient supply of nutrients and phytochemicals. Low consumption of fruits and vegetables is among the top ten risk factors resulting in global mortality. Annually, 2.7 million lives could be saved with sufficient consumption of various kinds of fruits and vegetables . Each colour carries its own set of unique disease fighting chemicals called phytochemicals. It is these phytochemicals that give fruits and vegetables their vibrant colour and of course some of their healthy properties . Phytochemicals are nothing but plant chemicals that do not have any nutritive value but essential for the prevention and treatment of diseases. Foods contain millions of phytochemicals and the colour doesn’t mean that they contain that particular phytochemical. Thus foods are classified according to the principal phytochemical they comprise, into five sorts as discussed below. Lycopene is the predominant pigment in reddish fruits and veggies. A carotenoid, lycopene is a powerful phytochemical that is responsible for prevention of heart attacks and prostate cancer. Lycopene is less bioavailable when raw, processing method could help to release the lycopene from the matrix in fruits and vegetables, and thus increases bioavailability. Lycopene is found in Tomato, red capsicum, red apple, strawberries, guavas, watermelons. Blue/ purple veggies and fruits contain anthocyanin pigment. Anthocyanin play a beneficial role in visual acuity, cancer, heart diseases and neurodegenerative disorders. They are found in Eggplant, Beet root, purple cabbage, blueberries, blackberries, prunes, plums, pomegranates. Carotenoids give this group their vibrant colour. A well-known carotenoid called Beta-carotene is found in mangoes, corn, orange, papayas, sweet potatoes, pumpkins and carrots. It is converted to vitamin A, which helps maintain healthy mucous membranes and healthy eyes and immunity. Taking large doses of vitamin A can be toxic, but your body only converts as much vitamin A from beta-carotene as it needs. That means beta-carotene is considered a safe source of vitamin A. The natural plant pigment chlorophyll colors green fruits and vegetables. Cruciferous veggies such as broccoli and cabbage contain the phytochemicals indoles and isothiocyanates, which may possess anti cancer properties. Green vegetables are excellent sources of vitamin K, folic acid, potassium, as well as carotenoids and omega­3 fatty acids. Vitamin K is essential in blood clot formation. Diets high in potassium are associated with lowering blood pressure, and there is an inverse relationship between cruciferous vegetables and cancer, especially colon and bladder cancers. Chlorophyll pigments are essential for wound healing. ANTHOXANTHIN is a white to yellow pigment found in onions, garlic, potatoes, mushrooms, cabbage, cauliflower, turnips, parsnips, white wheat flour, and pears. Garlic and onion contain a range of health-promoting phytochemicals such as allicin which is known for its antiviral and antibacterial properties. Some members of the white group, such as bananas and potatoes, are also a good source of potassium. Benefits include lowering blood pressure, cholesterol, and stomach cancers. Consuming an assortment of fruits and vegetables everyday not only provides you with variety of taste and texture but also provides you with a wide range of nutrients and increases protection against diseases. Each colour provides various health benefits and no one colour is superior to another and a balance of all colours is important. So from today, let your plate be a rainbow of colours with vegetables and fruits. 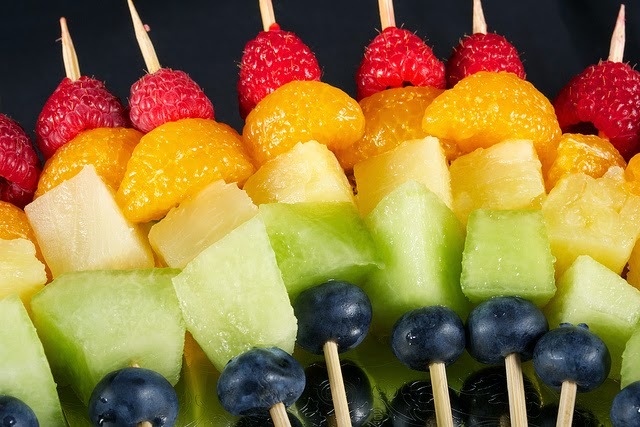 Eat a rainbow, Fact sheet, Nutrition Australia ACT Division, 2013. Is Saffron good for you? How to make bread omlette?